这帮厚道的大叔也特靠谱的把历届精品都攒一块儿出了个双张，挨个儿按年代听下去，又想起少年时的各种轻狂，想起当年那些一样爱听REM的朋友，随着REM的离去，那一代乐迷也都渐渐消隐了吧。 The notion of absence making the heart grow fonder was never better demonstrated with the world’s recent rediscovery of R.E.M.. A band that most would agree had become less and less vital over recent years, all it took was a simple announcement of goodbye in September to send us scurrying back to those old records. Given their firm assurances that this really is the end of the road – no farewell tours, definitely no comeback – Part Lies… represents a final gesture. Even then it manages to charter new ground, the first compilation to gather together their entire career, at least in terms of single releases. Track listed chronologically, it reflects how the Athens band went from unknown to cult to mid-level success to global stardom and down the other side. The music, too, tells the story – moving from the enigmatic introspection of their early work right up to their commercial heyday. Along the way are some of the most genuinely stunning musical moments of the past three decades. Given the problem with consistency that most bands seem to have these days, the five year streak of Document, Green, Out Of Time and Automatic For The People is nothing short of staggering, a period that saw them produce era defining singles that served as a gateway to even more amazing albums.The fact that this status didn’t entirely diminish speaks volumes as to what the band had achieved over the years. Given the quality of what had gone before, it is not surprising that each new release was greeted with hope of a return to form and then left most disappointed. Yet so influential, so truly historic was that form that it was perhaps no surprise that REM were unable to match it – after all neither could most other bands. 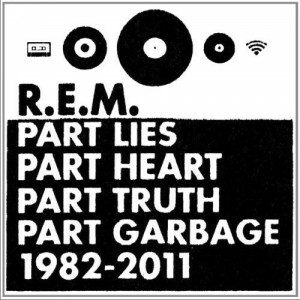 Packaged simply but stylishly and with often fascinating sleeve notes from all members (including the retired Berry),Part Lies, Part Heart, Part Truth, Part Garbage 1982–2011 is quite the way to bow out. You could argue that it reflects only part of the story but the albums will always be there to fill in the gaps. 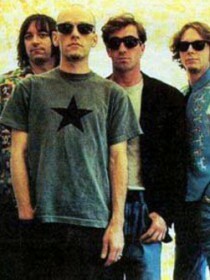 As with everything they did, REM leave us with dignity and some wonderful, wonderful music. 25 What’s The Frequency, Kenneth?